Now that the season is officially over I figure it is now time to finally put up pics of the last two Dodger Stadium giveaway 60th Anniversary sets. Featured below are the cards from the 2000's -- using the Topps 2001 Baseball design. I'll have scans of the final set tomorrow. As with the prior three sets, the first six cards highlight Bellinger, Turner, Seager, Jansen, Taylor and Utley. The seventh card honors Clayton Kershaw -- whose rookie cards hit the market in 2006 in Bowman and 2008 as a part of Topps flagship set. Lastly, I'd like to thank Andy from the Stadium Fantasium blog for sending me a complete set. Thanks, Andy! 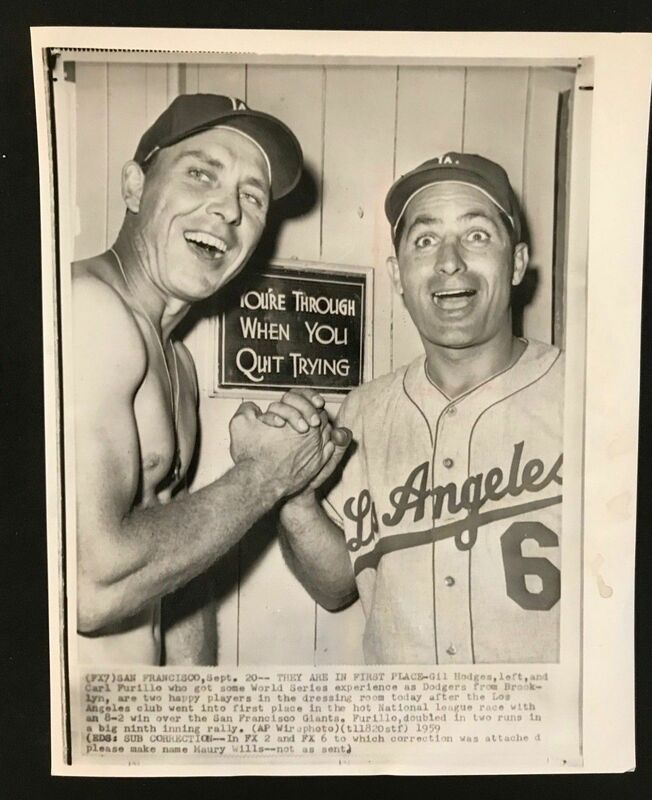 THEY ARE IN FIRST PLACE - Gil Hodges, left, and Carl Furillo who got some World Series experience as Dodgers from Brooklyn, are two happy players in the dressing room today after the Los Angeles club went into first place in the hot National League race with an 8-2 win over the San Francisco Giants. Furillo doubled in two runs in the a big ninth inning rally. This Day in Dodgers History: In 1956 the Dodgers sell Ebbets Field to real estate developer Marvin Kratter. The sale includes an initial three-year lease for the team and is eventually extended two more years. This sale is the first clear signal that the franchise would be seeking a new home soon. In 1963 Sandy Koufax is named the National League MVP Award winner. In 2007 it is announced that manager Grady Little is leaving the Dodgers with a year left in his contract.